Here I am, minding my own business. 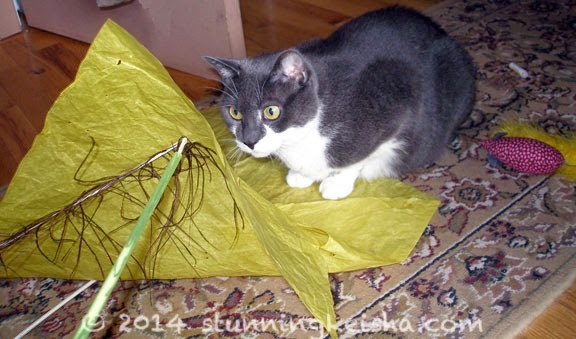 I have my tissue paper; I have some feathers and I’m just waiting for someone to play with me. What can I possibly be doing wrong? Yet, I am being blamed once again for something beyond my control. Pop changed the air conditioner filter yesterday. He has to climb up on a 10-ft ladder since the filter is 14-ft off the floor. It’s part of our “crawl space” that neither Pop or TW is brave enough to crawl into anymore. Well, Pop is but TW won’t let him. Something about him being clumsy. TW says the filter is already dirty with CAT FUR. CK: How do you know it’s cat fur? TW: Every time we change it, the filter is gray and furry. Our cat is gray and furry. Coincidence? CK: Um, have you forgotten who else is gray? HHGutt! Can you prove it is mine? Have you taken DNA samples? TW: We’ve been through this before. HHGutt doesn’t shed. You do. It all boils down to the fact that the ac filters are supposed to last for 90 days and ours are lucky they last for a month in the summer. Because filters are kinda pricey, they don’t want to change it every three weeks. In a month’s time, they are so furry that the peeps are embarrassed to put them in the Refuse Room. I’m sorry I don’t have a photo of the last filter they discarded filled with Gutt’s fur. The peeps say it’s all my fur. TW says the reason they keep the condo a few degrees lower than they’d like it is for me. Since I have a fur coat that’s not removable and breathing problems, they want to make sure I’m comfortable. When they had it turned up, I wasn’t running or playing so they did it “out of love” for me. I think they did it so they could blame me for something else. What say you? If you have ac, what temperature do your peeps set the thermostat for in the summer? And what color is their hair, CK? Huh? Huh? Just askin'!!! Deeply unfair. I mean if they said the hair was STUNNING and grey, I'd be like 'ok, that's CK'. But to simply accuse you like that... outrage! We keeps it around 76 here. My human, like we cats, is a heat-seeking creature. She keeps the central air around 80 (except when her boyfriend is home and not on tour, then she has to drop it down to 78). In the living room, with the wall AC, she just cranks it up to max and I don't know if she has EVER changed that filter! Shocking, I know! Since it's summer year round over here, Mommy would love to keep the a/c running all day long, year round. But something about burning a huge hole in the wallet and the ozone stops her from doing so. On super hot days, she'll turn on the a/c for maybe 30 mins or so at 65F just to cool down the room. Having been born in this climate, we guess we are kinda used to the hots. We'll lay under the fan or on the cold tile floor in the bathroom if it gets a little too warm. Oh how could they blame you. HHGutt can be shedding when they are not watching. I know some of our kitty toys walk around in the house when we are asleep. We keep AC at around 78 in summer. Reminds me that it may be time to change filters..
Dang CK, I thought those filter things came with fur already on them! We don't have AC is this country only offices and shops and the like so we have to put up with the heat like it or not. Glad you are staying cool CK. Have a fabulous Friday. We have fans in every room and a window AC unit in the living room. I crank it to 10 and let it get as chilly as possible ;) And I only vacuum the filter a couple times a summer. Picked on again! My goodness....well, my Dad complains about changing our filters but it's DUST that's the culprit not me (at least for now). He changes them every 3 months whether he wants to or not thanks to Mom's nagging. We keep our AC at 73 in summer - although at night they turn it down upstairs (two separate systems) to 70 for sleeping purposes. Even though I am furry (of course) I do sometimes get cold so I just ask politely to be allowed to visit the garage off the kitchen. It's always nice and warm out there. Lucky me. We keep ours at 72 when mom's home and a little warmer when she's not. I don't know how anyone keeps their house in the high 70s or even 80 (sorry Sparkle). Mom would pass out if the house were that hot all the time. CK, that fur can't be yours. You're not ever up there. How could your fur get all the way up there? We have a small apartment, so one a/c unit is enough plus we have one fan when it's not muggy out and the windows can be open. Our a/c (and our fan) have removable filters that get cleaned and put back. The apartment management suggests cleaning the a/c filter once a week. Did they know I was coming to live here, or what? We get the same complaint here, CK. Though the mom is cheap and she won't run the ac unless it's really hot...like it has to be 90 before she'll turn it on. We're sweating bullets, but she's just too cheap. The filter that we use lasts a whole year. So you can just imagine how furry it is when the peeps change it. I usually only put on the AC when its hot (DUH), but since Mikko and Jax are both, well, not long-haired, I guess it isn't on a lot. I tend to get cold easily. I say you ought to check TW and Pop's HAIR!!! ...uh, do you think they just might have some GRAY hair??? WE keep ours at around 75, CK. And um, not for nothing, but don't Pop and TW have gray hair??? Just axing! We are with Sammy. 76 when Mom is at work, 73 when she is home and 70 at bedtime because it is to hot in our little bedroom when all 5 of us sleep with Mom otherwise, even with two fans. I don't even look at the thermostat any more. I lost the battle, and wear long pants and a sweater in the apartment. Fortunately, the cats have many sun spots to hang out in, none of which are in my office. Air conditioning?? In the UK we just open the window!! It must be Gutt because you have short furs like me...Neytiri's furs are what clog our filter and we keep it at 78.